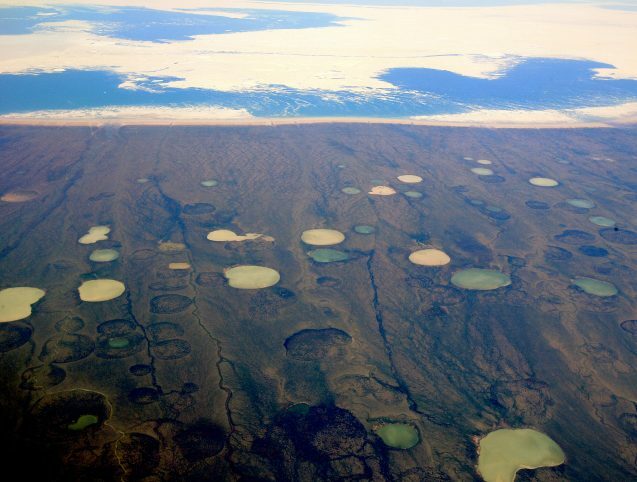 Found under a layer of soil, permafrost can be from three feet to 4,900 feet thick. It stores the carbon-based remains of plants and animals that froze before they could decompose. Scientists estimate that the world’s permafrost holds 1,500 billion tons of carbon, almost double the amount of carbon that is currently in the atmosphere. 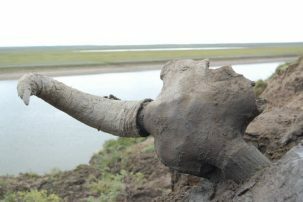 O. Roger Anderson, a biologist at the Earth Institute’s Lamont-Doherty Earth Observatory, explained why permafrost releases carbon as it thaws. 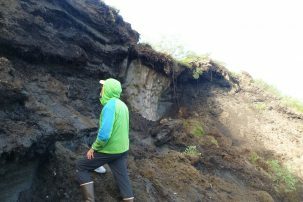 The ‘active layer’ of soil on top of the permafrost, which may be two to 13 feet deep, thaws each summer and can sustain plant life. This layer releases carbon from the roots of plants that respire out CO2, and from microbes in the soil. Some microbes break down the organic matter into CO2. Others, called archaea, produce methane instead, when conditions are anaerobic—when the soil is saturated with water or no oxygen is available. Methane is 20 to 30 times more potent than carbon dioxide at exacerbating global warming, but it remains in the atmosphere for less time. Scientists don’t know the relative proportions of carbon dioxide and methane emissions that might result from largescale thawing permafrost, said Anderson, because this has never happened in human history. 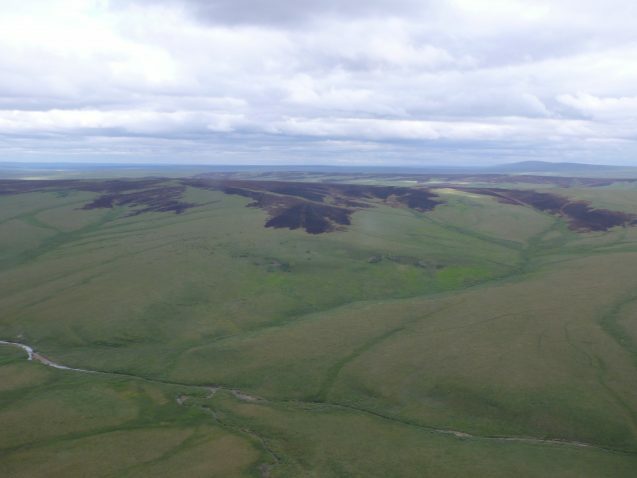 However, research on the upper layer of the tundra (treeless plains overlying the permafrost) suggests that the average carbon dioxide emissions are about 50 times higher than those of methane. “And we know that for every 10 degrees Celsius that the soil warms up, the emission of CO2 will double,” said Anderson. Gaglioti’s models show that the sensitivity of the underlying permafrost is highly dependent on the thickness of the peat. 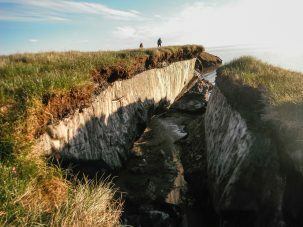 “The fate of the underlying permafrost rests in some ways on the stability of the peat layer,” he said. 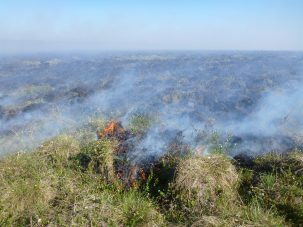 Wildfires can peel back the peat and make permafrost more sensitive to climate change—and they’re expected to increase in tundra regions, Gaglioti said. Warmer and drier summers make vegetation more combustible. Warmer temperatures also bring about more thunderstorms and lightning strikes that can spark wildfires. 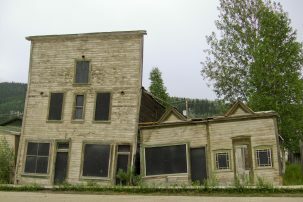 In Inuvik, a town in northwestern Canada, researchers are experimenting with new varieties of pilings to stabilize buildings, but they haven’t yet found a perfect solution. They say it’s hard to know what will work best because no one in the Arctic has ever experienced the rate of permafrost change that is occurring today. While the most recent Intergovernmental Panel on Climate Change’s report acknowledged that permafrost is warming, its climate models did not account for these emissions when making climate projections. That’s because ultimately, how much the planet warms from thawing permafrost will depend on how much carbon is released, how quickly, and whether it is in the form of CO2 or methane. 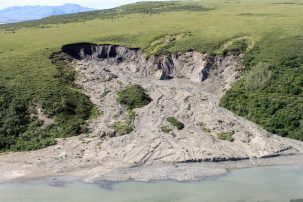 But to get a fuller understanding of this phenomenon and to be able to make more accurate climate projections, scientists need to be able to better assess the vulnerability of permafrost to thawing and its many consequences for the Arctic and the planet.